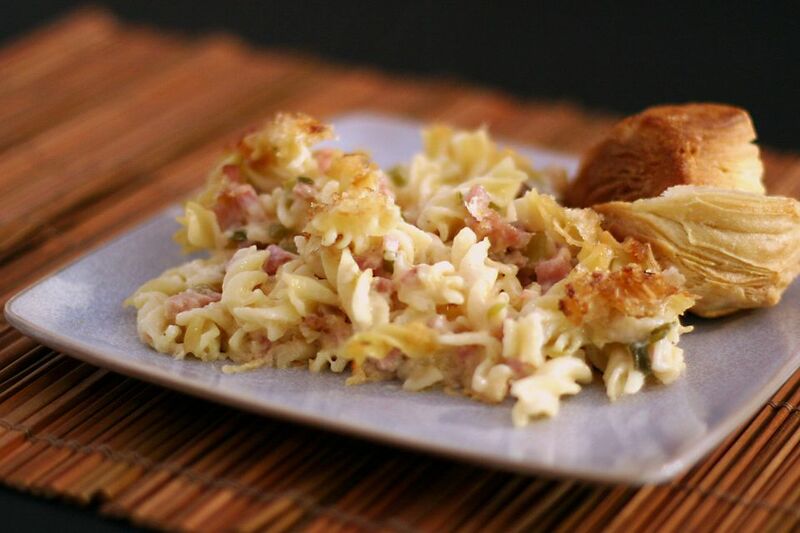 Reminiscent of the flavorful tastes of Cordon Bleu, this tasty ham and Swiss cheese casserole make a super family meal that, despite the list of ingredients, is fairly simple to prepare. Serve with biscuits and a tossed salad for a well-rounded weeknight meal. Cook the pasta in boiling salted water as directed on package; drain. Grease a 2 to 2 1/2-quart casserole. In a large skillet or sauté pan, melt butter over medium-low heat. Add celery and cook until celery is softened. Add green onions and ham; cook for 1 minute longer. Stir in flour until blended. Continue cooking, stirring constantly, for 2 minutes. Gradually add milk, salt, nutmeg, and pepper. Cook, stirring, until thickened. Add the Swiss cheese. Set aside about 1/4 cup of the Parmesan cheese for topping and add the remaining Parmesan to the sauce with the Swiss cheese. Cook, stirring until cheeses are melted. Add the drained pasta and stir, blending well. Spoon into the prepared casserole dish. Melt the remaining 1 tablespoon of melted butter and toss with the bread crumbs and the remaining 1/4 cup of Parmesan cheese; sprinkle evenly over the casserole. Bake for 25 to 30 minutes, until bubbly and lightly browned. Replace the Swiss cheese with Gruyere cheese or a similar kind of cheese. For a richer sauce, use half-and-half instead of milk. Replace the fusilli with rotini or elbow macaroni.